Join one of our popular Dining Trains from Buckfastleigh station and enjoy a traditional Sunday Lunch or Afternoon Tea. Plus, keep an eye out for new events and themed evenings that will be added throughout the year. You can also book tickets by contacting us. 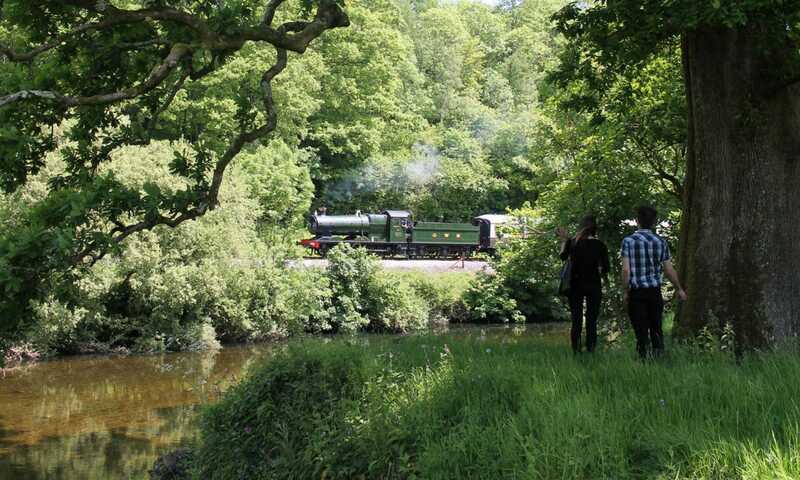 Enjoy a traditional three course Sunday Lunch aboard the 12.15pm train from Buckfastleigh. Passengers will be served a traditional Soup, followed by a Roast Lunch with choice of meat and finished off with a choice of Dessert. Menu options are taken on the day at the table. Gluten Free, Dairy Free, Vegetarian and Vegans options are available. Vegan main option must be pre booked by contacting us. Tea and Coffee will be served after the meal. A bar service is available on board providing a selection of wines, local beers, ciders and soft drinks. View the full Sunday Lunch menu. The train journey and meal take around two and a half hours. Tickets on board the South Devon Limited Restaurant Car for Sunday Lunch are £49 per person. This includes your train fare, first class supplement, all courses of your meal, and unlimited travel on other public SDR services for the whole day of your visit. Drinks are available to purchase from the at-seat bar service. Tickets are available to purchase in ‘tables of two’ or ‘tables of four’ and multiples thereof. We regret that due to the seating layout of the train it is not possible to purchase individual tickets or other than in multiples of two or four. Passengers should take their booking confirmation (or reference number) to an SDR booking office when they arrive to obtain their ticket for unlimited travel on SDR public services that day. Passengers should then make themselves known to the Restaurant Car Steward on the platform (opposite the museum) at Buckfastleigh at 11:55am. You can book tickets by clicking the links in the calendar above or by contacting us. Join the Restaurant Car from Buckfastleigh at 4:25pm for a traditional Afternoon Tea of Sandwiches, Savories, Cakes and a Cream Tea served to your seat. Afternoon Tea has options for Vegetarians. (must be pre booked).The Experience lasts for 1 hour and 45 minutes and is the ideal way to indulge in traditional West Country delicacies whilst enjoying the beautiful Devon scenery. View the full Afternoon Tea menu. Tickets on board the South Devon Limited Restaurant Car for Afternoon Tea are £39 per person. This includes your train fare, first class supplement, all courses of your meal, and unlimited travel on other public SDR services for the whole day of your visit. Drinks are available to purchase from the at-seat bar service. Tickets are available to purchase in ‘tables of two’ or ‘tables of four’ and multiples thereof. We regret that due to the seating layout of the train it is not possible to purchase individual tickets or other than in multiples of two or four. Passengers should take their booking confirmation (or reference number) to an SDR booking office when they arrive to obtain their ticket for unlimited travel on SDR public services that day. Passengers should then make themselves known to the Restaurant Car Steward on the platform (opposite the museum) at Buckfastleigh at 4pm.